Dry shampoos have become more and more popular over the last little while. They can be a major time saver for those who need a quick pick me up or don’t have the time to completely wash and style their hair on a given day. They’re also great for maintaining your hair’s health and vitality. Too much washing and heat styling will break down your hair and strip it of it’s natural oils, drying it out and leaving it brittle and fragile. Dry shampoos allow you to maximize the time between your washes and blow drying sessions. Shinier, healthier hair is the result. Although they’re a must-have beauty product, store bought dry shampoos can retail for anywhere from $5 to $40, giving us one more expense to cover. To eliminate the extra expense (not to mention the chemicals most store bought formulas contain), try out this homemade dry shampoo recipe. It’s tried and true and can be made for less than a couple dollars. It will absorb any excess dirt and oil at your roots and revive your hair in a snap. I’ve found that it also gives me extra volume too. Mix the cornstarch and baking soda together in a bowl with a fork. Add five drops of essential oil and mix until very well blended. If you want the mixture to be more potent, add up to five more drops. You can also choose a few different essential oils that go well together and create a unique blended concoction. Use 1-3 drops of each (5-10 drops total). Have fun experimenting to create your own signature scent. We love blending lemon, orange and pink grapefruit for a delish, fresh citrus version. Store in a jar that is big enough for you to easily use with a large makeup brush. Swirl the brush lightly in the mixture and apply to your roots. I create a deep part on one side and lightly dust the shampoo with my brush along that part. Next, I create another part (no more than an inch closer to the middle) apply the mixture again. I repeat this and work my way all the way to the other side. You can also ‘spot treat’ and just dust the shampoo in particular sections where you need it that day. Keep in mind that you only need to apply it to your roots. Once you’ve applied the shampoo, let it sit for a bit. It will look kind of greyish right after the application, but don’t worry! It takes just a bit for it to fully absorb and you’ll brush it out afterwards as well. I like to give it anywhere from a few minutes to about 20, depending on how soon I need to be ready. For very dark hair, use the dry shampoo an hour or two before going out. This will give the lighter shampoo mixture time to absorb and disappear. See variation 2 below for another alternative for dark hair. Next, use a boar bristle hair brush to comb through each section of your hair, brushing out any excess shampoo. You can also top things off by using your hair dryer on cool or medium heat for just a few seconds. 2. For darker hair, substitute unsweetened cocoa powder for the cornstarch. This will create a darker mixture which will blend more quickly into darker shades of hair. For this option, vanilla essential oils work well. You can also try other scents, but you’ll want to test them out and pick ones that won’t clash with the light cocoa scent. 3. For an extra ‘drying’ formula, substitute the 1/4 C. Baking Soda with 1/8 C. Baking Soda and 1/8 C. Baking Power (half a 1/4 C. or 2 Tbs. of each). Baking powder will dry out your hair a little bit more than baking soda, so replacing half the baking soda with baking powder will help tackle your hair if it tends to be particularly oily. For normal hair, this variation may dry out your hair too much. Try both options to see which works best for you. * We’ve seen other recipes including things like cornmeal, salt, ground oatmeal and even ground almonds. After trying some of these variations, I wouldn’t recommend them – it was too hard to completely brush them out and my hair was left feeling very.. well, gritty. * Also, some people use a shaker container for their dry shampoo. We like the brush method much better since you can apply it directly to your roots where it is the most effective. We found that we had less control with a shaker and that our roots were under treated and the rest of our hair was over treated. If you try this out, let us know which formulas and variations worked best for you! Do you have any favorite scents? We’d love to hear about it in the comments. Oh good, Maram! I hope you like the recipe!! This sounds great! Thank you for sharing a recipe for dry shampoo. I was unsure how to make it. What a great tip. Corn meal also works well as a dry shampoo and helps get rid of dandruff. Yep, just plain old cornmeal and leaves to smell for those who are allergic to certain products. I will have to make this to try on those days that I’m running late. Thanks for the recipe! I am almost out of mine so this was a perfectly timed post, thank you! Such a helpful recipe ! Thank you so much for posting it up! I pinned it so I wont loose it! Have an A+ kinda day! Great post! I never knew you could make your own dry shampoo. I may have to give this a try sometime. Great reciepe! I would try it. i definitely have to make this!! I can’t wait to try this! I just had surgery and won’t be able to wash my hair by myself for several weeks. This will work on the days I don’t have help. Just in time! woow! i’ll definatly try this ! I’m definitely going to give this a try; I hate the cost of buying the small amount of dry shampoo you get in the retail products! So cool, I already have all of these ingredients on hand! Thank you!!! Something new I can try to make, I’ve already made my own deodorant. Love me some dry shampoo- especially in the summer! Can’t wait to try it. Thank you! I have tried many different commercial products and they all left my hair feeling nasty. I will try this and see if it works better than the commercial types, but I have no faith in dry shampoos at this time. I’d like to be able to use dry shampoo but I just can’t stand the feeling of any I have tried, DIY or store bought. I wish there were something like this that worked with my hair. I just prefer showering over putting more stuff in my hair and weighing it down even more. This sounds like a great recipe. I have all of the ingredients except the essential oils and I’ve been looking into getting into those, Thanks for sharing. I’m going to have to try this! I can’t keep washing my hair every other day! Love this idea, will try! I will try this. I’ve purchased names brand dry shampoo’s before but they never seem to make my hair look ok.
Never used dry shampoo before but I would love to make this and try it out! Dry shampoo is the best! Can’t wait to try this! I have never done this before. It looks fun to try! I would love to try this. I have pinned it to try in the next few weeks. Thank you for sharing this. I’ve pondered about making my own before, but never bothered searching out how to do it, so thanks for blogging about this! This is cool, I’d like to try this! A couple of times I’ve tried massaging baby powder into my roots, but it wasn’t so great. This is inexpensive, easy and perfect!!! I am obsessed with dry shampoo! I can’t wait to try this! I need this. Gonna try it. Thanks! Wow, this is a cool thing to refresh your hair on the go. Would be good to do in the winter, too, to avoid your head being wet running out the door. Thanks! any recipe for hair fall? I’ve never used this before, but it looks so simple. Now THIS I have to try! Lavender Dry shampoo…with no ingredients I can’t pronounce. I will be trying this. In between washes I am in need of something! This sounds simple and perfect. Thanks for the great article and recipe for dry shampoo, I am always happy to find ways to save money. I am super excited about this! I know it is not healthy to wash your hair everyday but I do like my hair to look nice!! going to try! Why didn’t I find this earlier? I’ve spent way too much money on dry shampoo. Thanks for sharing. Thank you for this recipe !! My daughter always buys dry shampoo for deer hunting because her hair is so oily. Now I can give her this recipe and it won’t cost her as much !! Okay, I tried this and it’s great! I even had all of the ingredients already. that’s it? OMG what have I been doing buying dry shampoo for so long! lol no longer!! 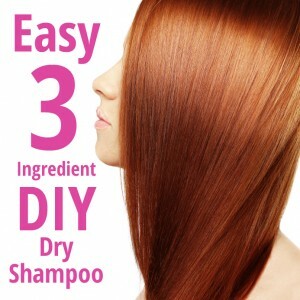 Thank you for sharing a recipe for dry shampoo. I’ve never used this before, but it looks so simple. I’ve been wanting to try dry shampoo! I never knew it was so easy to make at home! I can’t wait to make this on my own. I don’t buy Dry Shampoo because I have no Income and it’s so expensive. But your blog has me thinking that Rose and Lavender oil would be something I could invest in nd would last me thru many mixings! Thank-you so very much for posting. Any more ideas? I’ve honestly never thought of using these ingredients for something like this. Very interesting … I’ll definitely try it out sometime! Love this! Cant wait to try and find out how it works on my hair!! Amazing and really simple to thanks for the tip! Wow – this looks so easy! Thank you for sharing this DIY!! Interesting and worth a try! I’ve tried some high end and low end dry shampoos. I haven’t liked any so far. They worked as far as making my hair look less oily, but the way it felt on my scalp was less desirable. Haven’t really tried dry shampoo but this seems interesting!! Thanks!! Very clever! I’ve never tried dry shampoo but my daughter uses it all the time. Thank you so much for this recipe. Years ago I used Pssssst but I would much rather try this. I have not tried dry shampoos before but sometimes wet showers are not possible. This would be perfect for me. I will try this, thanks. It’s a very interesting concept….a dry shampoo. I guess the roots are all that need to be done. I will think this over a few times. Thanks for this! I’ll give it a try! I pay 8 bucks for a dry shampoo, this is so much cheaper, I’m going to try this. I love that your DIY is so customizable! You can make it smell however you like!